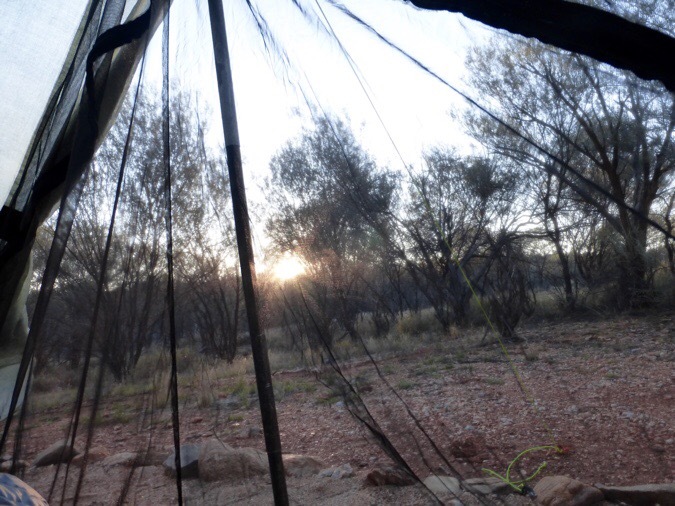 It was a cool morning that was perfect for staying in the sleeping bag. 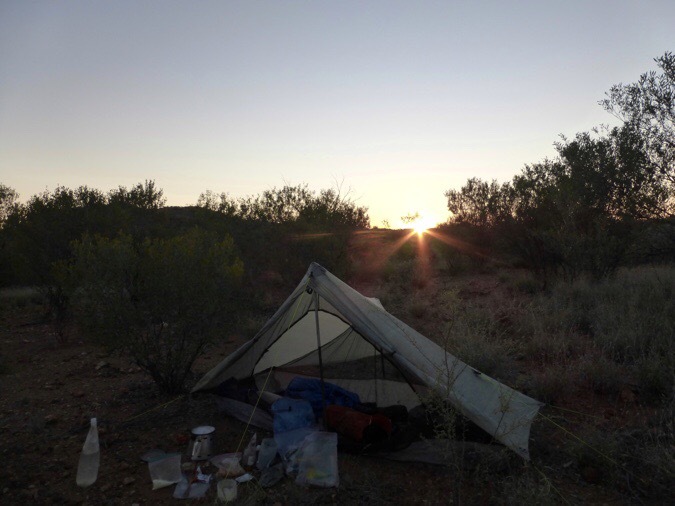 I had a pretty easy day ahead, so I relaxed in the tent and watched as the sun rose. I wrote yesterday’s blog entry and got going at 7:50am. Yep, quite late for me! Taking in the sunrise from my tent. There really wasn’t anything significant in the scenery most of today, but it was nice and enjoyable. 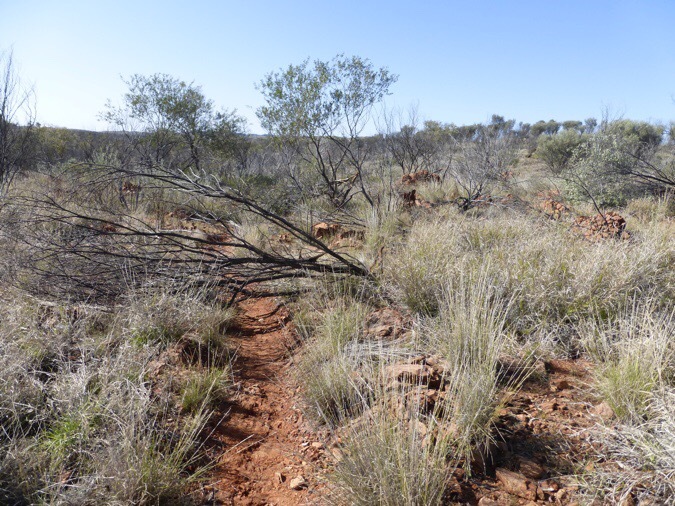 As expected, the trail meandered and rolled nicely with semi-rocky terrain. There is still a significant amount of water that I had to jump around a bit, but the trail was mostly up out of the sandy washes. 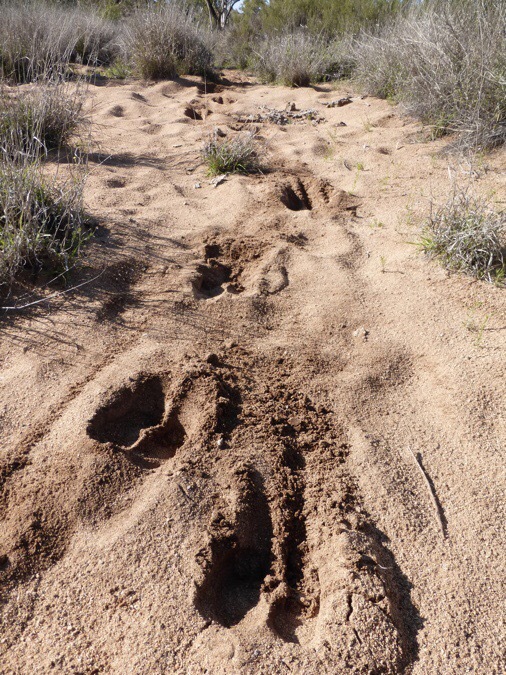 Early on, in one sandy wash I crossed, there were some massive prints from what may have been a bull. I had heard cows yesterday while up on the high route and there are more grazing areas as I get closer to town. The prints were huge and I didn’t want to run into whatever was making those prints. I asked Susan yesterday, and she too has seen little wildlife other than the birds. I expected to see at least a wallaby. Maybe on the Bibbulmun. My hope was that while I’m in Australia, I’d see a kangaroo, wallaby, and emu along the trails. I’ve heard hikers do have good animal sightings out here quite often, but I’m not sure where they are most common. As I was reflecting on this, I walked up a hill and turned a bend to see the owner of those huge hoof prints! Standing next to the trail just 20yds ahead was a huge bull! Huge and too close for comfort! He saw me and turned more toward me slightly forward. I wanted none of that! I got off the trail and curved as far as I could away from him while talking to him and making sure he knew where I was so I didn’t startle him. He just watched and that scared me. I wished he would just go back to munching on the grass. When I finally got back to the trail, he returned to his grazing. I walked fast and kept looking back for a few minutes before I felt fully relieved to have that experience over with. A creekbed with an actual creek in it! The rest of the morning, the trail was uneventful, except for all the downed trees covering it. The storm the other night did quite a number on the trees and they were all over the trail. Since I had an easy day planned, I decided to thank the trail gods for not having that bull gore me to death, and I decided to do my part with some trail maintenance. Oh man, I cleared a ton of fallen trees. I had to have moved at least 40 big trees over the morning and countless branches. My back, arms, and bad ankle were pretty sore as those muscles I was using to pull and haul had not been used in awhile. It had to have added an hour to my morning, but it felt like the right thing to do to keep the trail gods on my side! 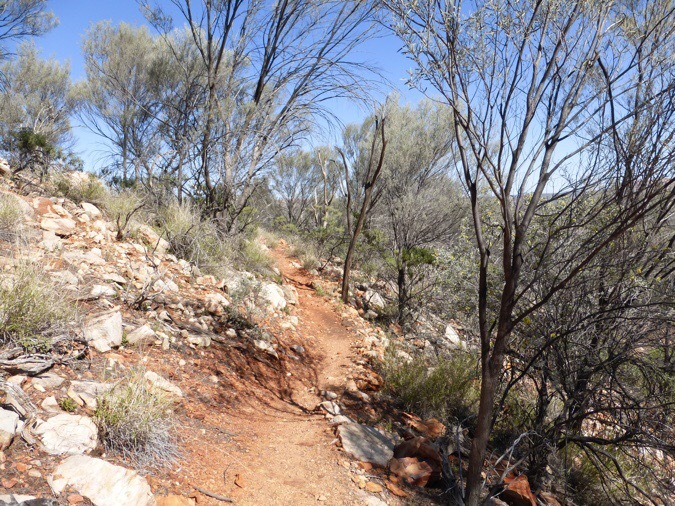 The last few miles before my lunch spot, the Larapinta overlaps with a trail called the Woodland Trail. Of course, more trees! I was pretty spent from what I had already moved, so I passed on half of those. I’m sure Susan will walk through and wonder why I didn’t move some of those, but I’m hoping she’ll notice all the countless ones I did move the miles before that. 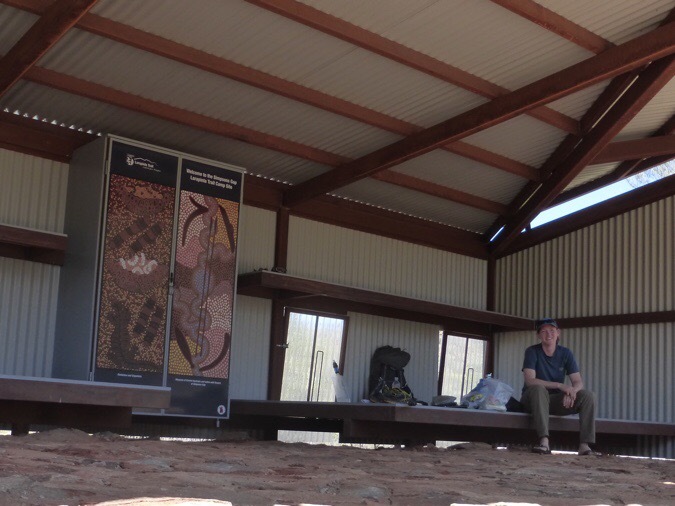 When I got to the shelter at Simpson Gap, it was a very welcomed sight and I took a nice long lunch break in the shaded shelter. It was just about 100yds from a major parking lot for Spencer Gap and I was happy to be by myself, tucked away from all that action I could see and hear below. Since I had the time and I was not in the mood for peanut butter, I made a bonus ramen I had and put in the remaining tomato paste on it. Yes, I’m hooked. It was a glorious break in the shade and I even took the time to do some writing about the morning so I would have some of today’s entry started before tonight. Spencer Gap Shelter lunch break. I caved and put on the ankle brace before I hiked out and it did help. I hiked out and saw my first people of the day as the trail went through the parking lot for Spencer Gap. I chose not to do the side trip for that one as there was a crowd and I wasn’t in the mood for that. 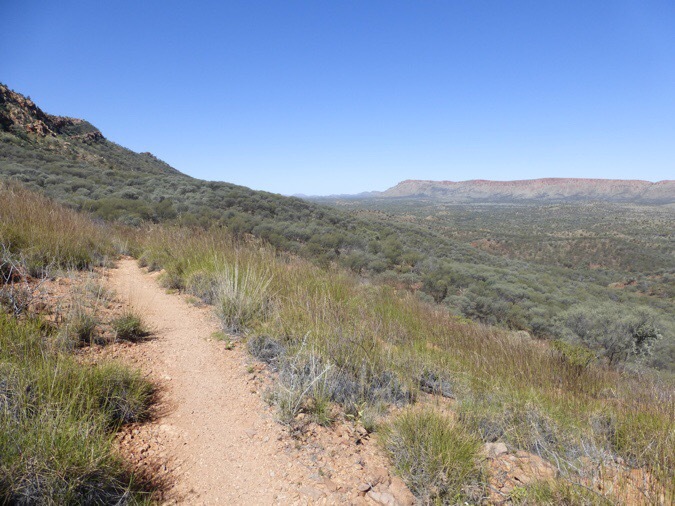 I headed on and the trail gradually went up to a nice view looking towards Alice Springs. I got my first phone service of the day and found a shady spot to sit and post yesterday’s entry. From then on the terrain was great and I was able to cruise. I got three Australian radio stations on my Sansa Clip and was fully entertained! It was fun to hear all of it. The news, sports, weather, traffic, commercials, and pop music. I got their national ABC news and found it interesting that the nation in some ways is treated like one big city. The weather was given for the five major cities in the country and when they did traffic, they also gave the update for each of those cities like you’d hear the Chicago traffic, but in this case the five roads mentioned were spread across the country. I was so entertained and look forward to more tomorrow morning. I’m sure the novelty will wear off soon, but it’s fun. I then noticed I had really good internet and plenty of battery. The trail was so smooth that I was able to multitask and have my phone read my emails aloud through my headphones and then I was able to dictate my responses as I walked and the phone typed them out. It was great to get a head start on some of the correspondence that I’ve fallen behind on the last week. 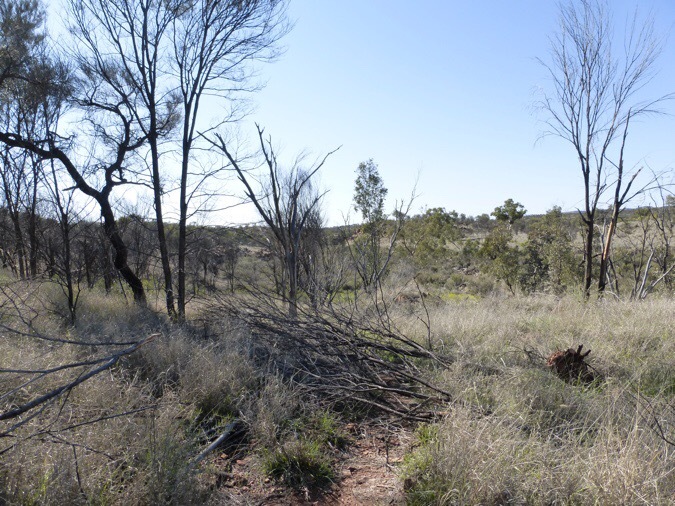 I passed the last shelter that is 8mi/13km from Alice Springs. 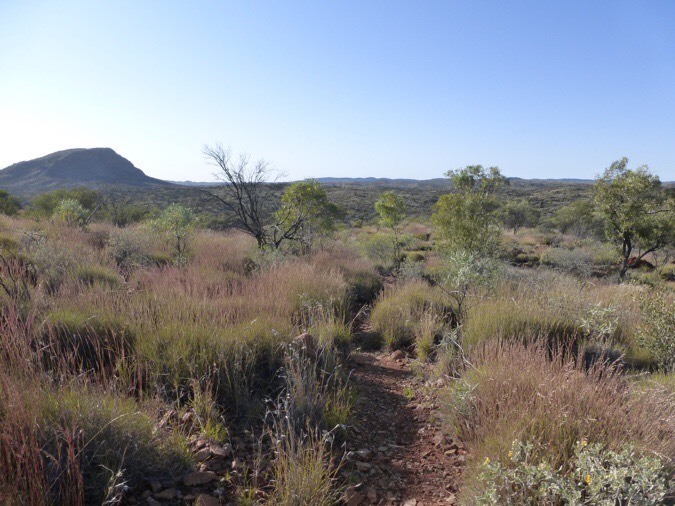 I knew I wanted to keep walking since it was just 4:30pm, so I grabbed enough water for cooking dinner tonight and walking into Alice Springs tomorrow morning and headed on. The trail went up gradually to a great ridge walk on Euro Ridge. I know people think going westbound and ending at Mt Sonder is cool, but I also really liked this final ridge walk and looking down on Alice Springs in the distance. It would have been cool to do this as the sun rose tomorrow morning, but it was also nice in the evening light. I took tons of photos up there. Euro Ridge with Alice Springs to the right. I got down the ridge and kept an eye out for good camping off the trail. I still wanted to be about 5mi/9km from town and not get too close. I found a nice spot where I could see the sunset one last night as I made dinner. I even have service and have been able to get lots done. I must have finally slept enough because I’m having no problem staying up past 10pm tonight. 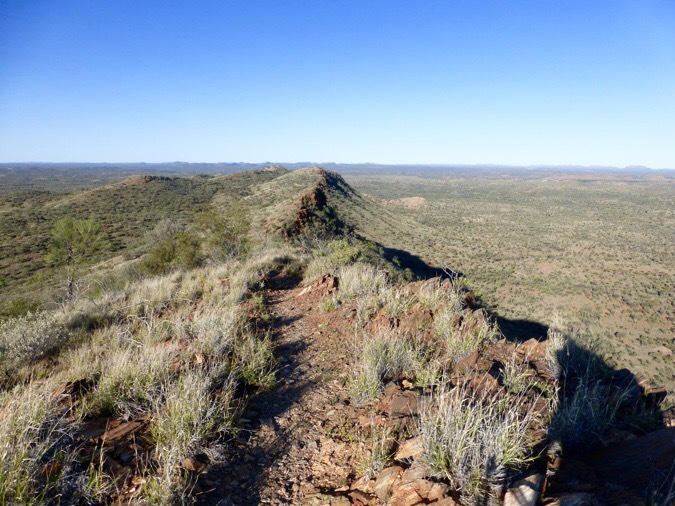 I have just 5mi/9km to the eastern terminus of the Larapinta and then about 45min walk to the hostel downtown. 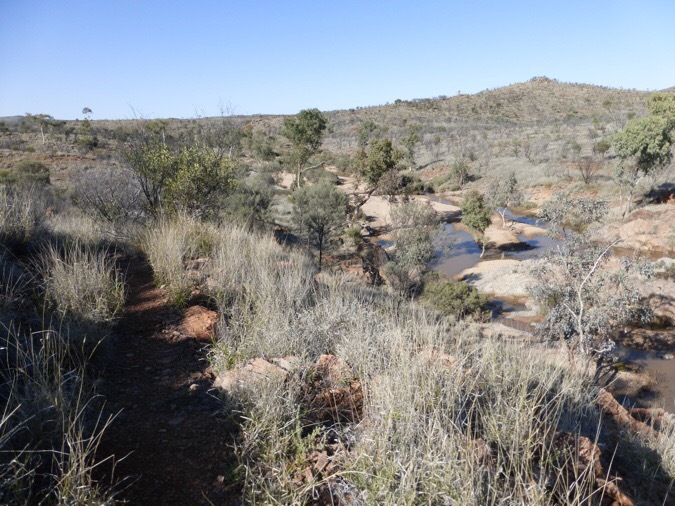 I get to walk in along the Todd River and am excited to see if it has water in it now that it has rained. If you recall, I took a photo in the sandy bed of the Todd River in town when I first arrived. I bet it did have water in it yesterday for sure and it has already drained. It would be cool to see it with water in it. Goodnight! Wow, those shelters are just amazing! The only ones I’ve ever seen are pics of the ones on the AT, and they look pretty shoddy. BTW, there was a bull on our farm that wouldn’t even glance up if the tractor, car or motorcycle drove by, didn’t even pay any attention to a person walking within a foot of his head, but the moment I pulled the bicycle out, the damn thing started scuffing his hoof and huffing through his nose – chased me a half-mile to the cattle gap until I was free and onto the blacktop road! Every freaking time. We figured he must’ve had a bicycle trauma when he was a calf or something, before dad brought him home from the auction. hahaha I got really fast on gravel on my single-speed Schwinn! They are made of metal due to termites out here. I notice they do bang and creak more than a wooden shelter, but feel solid. Oh jeez, I’d never go by that bull again! Oh man, what id give to see video footage of you talking to that bull while you walked around him. Can you provide a transcript of that please? ? Haha, there was a small part of me that wondered if there was a candid camera around! A very good resource for local bushwalking (aka hiking or in NZ calledTramping) is bushwalk.com. I posted your blog on it. So check it out in the general discussion section. An interesting thread ensued. OMG, that bull was huge. What a great day otherwise. Re your reaction to our radio stations, Australia’s population is only 23 million and most of that is in our main cities and along the coastline. That’s what I’ve heard. It’s pretty interesting the unity of a country so large with most people in those handful of places along the coast. Erin, reading the comments about your ultralight gear that they think will not work on the TA (which almost got me to post. I have great faith in your judgement).. But I wondered if you know how light Nancy went on the TA? Just from her pictures and blog it looked like the gear she normally uses. That bull looked almost as large as my Prius C! In the early 60’s we the Irvine ranch still covered a large portion of Orange County and cows were present right up to the edge of our development. We drove by them all the time. My brother would shortcut through pasture on the way go Jr high and I think he had to skirt around a bull at least once. One day I was driving my mom’s car home and broke down across the highway from cows ..
Apparently,a person on foot was most unusual! Those cows, who didn’t even look us as people drove by, were all lined up, along the fence, staring at me.. they were mostly around humans on horseback, not humans stranded on the road. 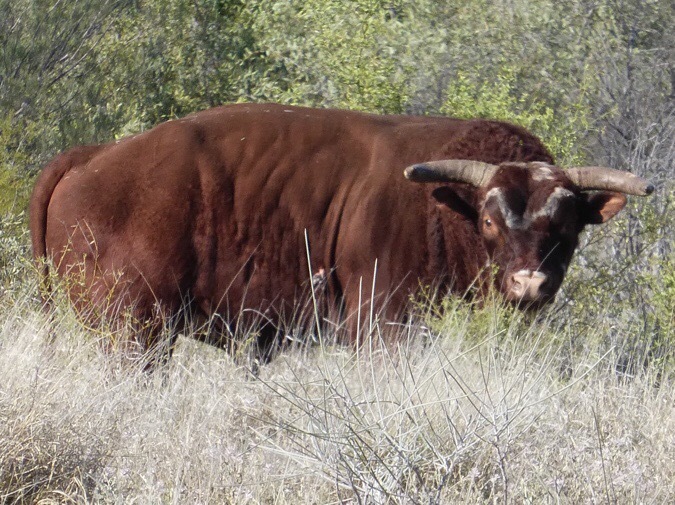 Your bull would look sweeter with a fence between the two of you. Yes, I may comment on that thread. Over here people are not as familiar with the lightweight stuff and question it more. Nancy (Why Not) is even lighter than me! But we do have the same tent, sleeping bag, and sleep pad. I’ll be just fine and many of my friends with the same gear have been too. It’s just that people are afraid of what they aren’t used to. Looked like a really great day. Except for the bull. Glad you got around him and kept on going. Interesting to read how “Wired” you were on the trail on this day. You are quite the multi-tasker.